When the merge fields and tables process is run, Narrative1 automatically creates comp maps in the background (requires Internet connection). The only requirement is the subject and each comparable have latitude and longitude values. Narrative1 report templates from the July 12, 2010 build have these merge fields in place and maps will update automatically on the Merge Fields action. For legacy Word templates, simply update the template by inserting the new merge fields with the Narrative1 Fields and Tables utility. 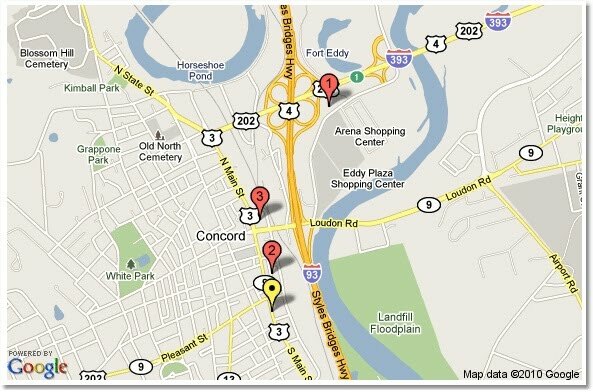 To preview comp maps, click the "Maps:" button at the top of the adjustment grid and select Google Maps (requires Internet connection) or Google Earth. If you don't see the "Maps:" button, use the "Sheet Controls" method. Click the "Maps:" button at the top of the adjustment grid and select "Merge Map Size". Sizes are set in pixels. The default size is 575 x 375, which produces the map shown above. Note the maximum dimensions are 640 x 640. If you don't see the "Maps:" button, use the "Sheet Controls" method.